Imagine going in for a cancer screening, and the technician turns to you and says, "We're finished, but if I push this button over here, the machine can detect even smaller cancers. But here's the hitch: You have to pay $700 if you want me to push this button." Myriad Genetics is doing something very similar with BART tests that determine if a woman has a potentially dangerous genetic abnormality linked to breast cancers. When testing shows that a woman carries a bad gene, she has a much higher chance of getting breast cancer. These women usually then get more frequent MRIs, ultrasounds and mammograms to detect cancer. Myriad owns the patent on breast cancer genes and so is the only company that can test for them. 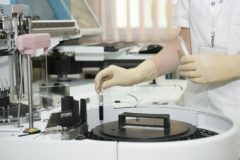 It offers one test that catches most, but not all, abnormalities, and then charges nearly all patients $700 for a second test that catches the rest. If a woman can't afford the $700 fee, she may miss an abnormality, which could mean the difference between life and death. Myriad defends the $700 charge for its second test, called BART, even though many patients can't afford it and insurance won't pay for it. How long do hotflashes last after taking Arimidex?